If you constantly find yourself pacing the kitchen, wondering what you can whip up for dinner in a pinch, this post is for you. For those of you who juggle busy lifestyles, wear a dozen hats, and constantly struggle to find a balance between work, life, and family, getting dinner on the table might seem like the last thing on your priority list. Yet, when your family looks up at you expectantly, wondering what’s for dinner, you know you have to think of something — and quick. You already know that a little meal prep can go a long way when it comes to saving prep time in the kitchen. But sometimes, there just isn’t enough time in the week (er, weekend) to chop vegetables, prep side dishes, or create entire meals for reheating. For those extra-busy weeks, slow cooker recipes could be perfect for your family. Simply toss all the ingredients (broth, vegetables, meat, herbs, salt, and black pepper) in your slow cooker in the morning, then set it to simmer on low for eight hours. When you arrive home from a busy day, dinner is ready to be served. During the most hectic of weeks, these delicious soups will help you maintain a sense of balance. If you’re looking for a soup that’s thick, creamy, and tastes like fall, this sweet potato soup is it. Made with a variety of vegetables, and using coconut milk instead of regular milk, this pureed vegetable soup is healthy, dairy-free, and — even though it’s a vegan recipe — contains an incredible 16 grams of protein per serving. With crimini mushrooms, carrots, onions, red potatoes, beef, and fresh herbs combined into one pot, how could you resist this Whole 30-friendly slow cooker beef stew? Want a low carb version? No problem. The author suggests using sweet potatoes or parsnips for a stew that’s low in carbs and paleo-friendly. Flavorful beef bone broth serves as a base to this scrumptious, creamy soup. With bacon bits, split peas, celery, potatoes, and carrots to bring out the flavor, this is a simple dish you can prepare any night of the week. You can make this delicious pot roast soup one of two ways: Either simmer it in the Crock-Pot for eight hours, or toss all the ingredients in the Instant Pot for a mere 25 minutes. With celery, potatoes, celery, and chunks of beef roast simmering together with fresh herbs, this is a one-pot meal your whole family will love. If you’re looking to switch things up from the standard chicken soup or slow cooker chicken noodle soup you’ve made dozens of times, you have to try this white chili. In stark contrast to a traditional chili recipe, this white chili combines shredded chicken breasts, chicken broth, green chilies, and white beans into one pot, creating a slightly spicy, yet more brothy version. If you just can’t be swayed from a classic chili recipe, try this recipe on for size. Green bell peppers, red peppers, onions, garlic, beef, and beans are smothered in chili powder and other spices to create a chunky chili that packs a punch. Top with a dollop of sour cream or guacamole to complete the dish. The secret to this slow cooker French onion soup recipe is the use of caramelized onions. Caramelizing the onions before you place them in the slow cooker (rather than allowing the slow cooker to do the cooking) is what gives this soup its buttery, luxurious flavor — well, the extra gruyere cheese certainly doesn’t hurt. While you might not associate a classic broccoli cheddar soup with any sort of diet, this keto version will make you reconsider. 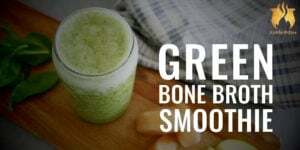 Made with broccoli, cheddar cheese, bacon, heavy cream, and chicken bone broth, this hearty soup contains 26 grams of protein and a whopping 45 grams of healthy fats per serving. If you once loved tortellini soup or lasagna soup but now follow a gluten-free diet, you have to try this recipe. By using cauliflower gnocchi, this incredible Instant Pot soup will satisfy all your Italian comfort food cravings, without the comfort-food-discomfort. Sausage, cauliflower, tomatoes, garlic, and gnocchi are simmered in chicken bone broth for a delectable soup you’ll make again and again. 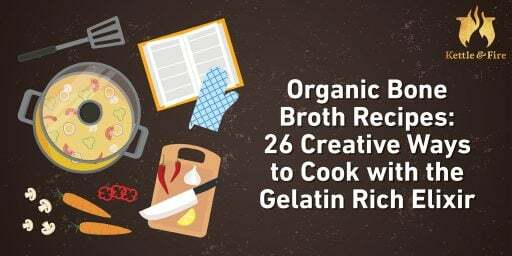 Come on now, you know we couldn’t make a slow cooker recipe round-up and leave bone broth off the list! 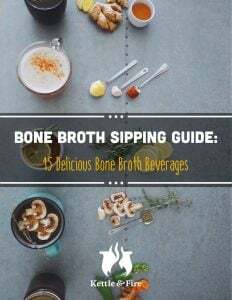 If you hesitate to make bone broth at home, this foolproof recipe is a good one to start with. All you have to do is pour all the ingredients into the Crock-Pot and allow to simmer for 12 hours. 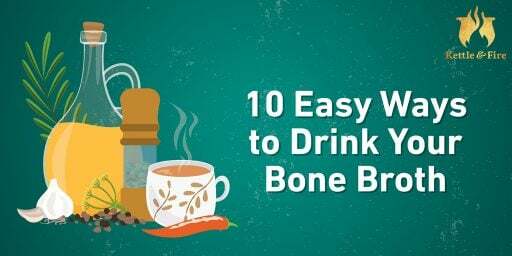 If you place the ingredients in the slow cooker at 7:00 p.m., a warm mug of bone broth will be ready for breakfast at 7:00 a.m. the following morning. To save a few precious minutes this week, pull the slow cooker out of the cupboard and allow it to do the heavy lifting. Simply combine all ingredients into the Crock-Pot in the morning for a complete meal that’s ready by dinner time. If you need to save even more time this week, don’t forget that Kettle & Fire has a number of pre-made soups (like butternut squash soup, healthy tomato soup, and grass-fed beef chili) that are perfect for your family. Simply heat any of these soups over the stovetop (or in the office microwave) for a healthy meal that takes zero time to prep.